Sanriotown Releases 3 New Blog Themes! We heard your requests, and we’re definitely ready and willing to answer what you’re asking for! We’re very excited to bring you these three new themes just for you. Now you have a total of twelve layouts to choose from to decorate your very own Sanriotown blog! These three brand new blog themes are now ready for members to spice up their blogs with! Designs include “Wedding Hello Kitty”, “Baby Hello Kitty”, and by popular request, “Hello Kitty Online”! Log on to you Sanriotown Account now and start blogging! And if you don’t have a Sanriotown account, sign up for free and enjoy several services, including E-mail (with character domains such as “hellokitty.com”, “mymelody.com”, and “kuririnmail.com”), Dream Studio, and Forums! Look Who Won the Contest! Ripplecloud, our very own HKO Trailer Contest Winner, received her prize today from the Sanriotown Staff! 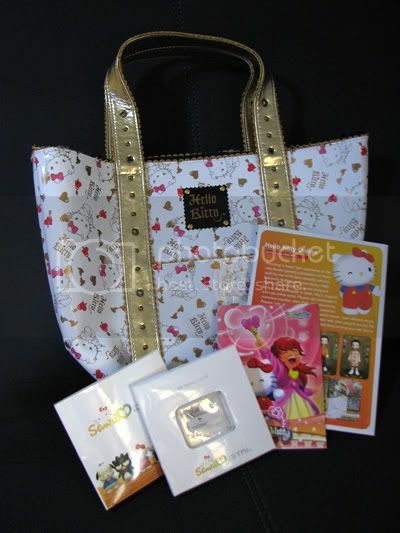 The gorgeous, Hello Kitty tote bag available only in Japan along with her limited edition 1 gig Hello Kitty memory stick! Congratulations, Ripplecloud! 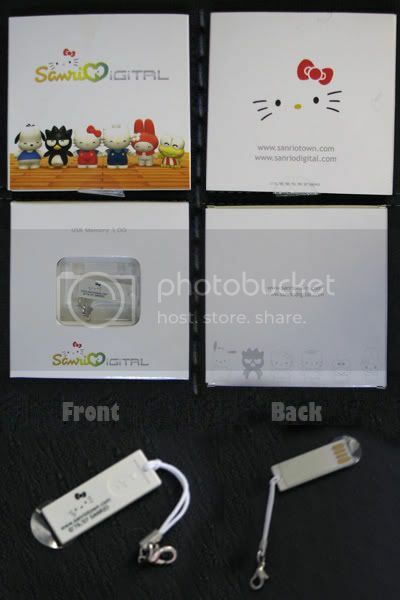 Read up about her package in her blog and visit her award winning Hello Kitty Online Trailer here. Watch out for more of our fabulous Sanriotown Contests coming soon! Hi everyone! Sanriotown’s maintenance on 13 and 18 August is completed. Now you can come back to enjoy our blogs and many other services! We’re sorry for any inconvenience caused, but don’t worry now, our service is back and even better! Hi everyone! Sanriotown will have a downtime from HKT 11:30 AM - 6:30 PM, 13 August 2008 for some server tweaking so we can serve you better. During this period, the site features might have disruptions or may be temporarily unavailable. SanrioTown Blog will also have a downtime from HKT11:30AM - 6:30PM, 18 August 2008. We’re sorry for any inconvenience this might cause, but don’t worry, we’ll be right back! Hello Kitty Matching Pairs Game on Sanriotown! If you’re ready and willing to face a challenge, check out the latest game on Sanriotown, Hello Kitty Pairs! The objective of the game is deceptively simple: all you have to is match the cards. Sounds easy, right? Not quite! Unexpected challenges await you, like moving cards, switching colors, and introduction of new characters and twists as you progress in the game. Try it out now here on Sanriotown! All you need is to sign in to play, so if you don’t have an account yet, register now! August Downloads are Now Available! The August freebies are now available for you to download! Choose from the likes of My Melody, KeroKeroKeroppi, Cinnamoroll, Little Twin Stars, U*SA*HA*NA, and many others and decorate your computer! From wallpapers to icons, you can take your pick and choose your favorites to use! To grab these freebies, all you have to do is log in to your Sanriotown account. If you don’t have one yet, click here to register and get your free account! You are currently browsing the Kitty News Blog weblog archives for August, 2008.